You’d think the NFL, the corporate and cultural behemoth of American sports, would have a set of rules governing the attributes of a franchise quarterback. You’d think, 100 years into this thing, it would have a stone-scroll template that determines how it chooses the young men who become the most exalted and fetishized athletes in the game. You would be wrong — not that it doesn’t try. Oh god, how it tries. It has the combine and the pro days and the interviews and the individual workouts and the jumps and the leaps and the shuttles and the endless measuring and the computerized timing and whatever else it can think of to analyze a human being within a centimeter of his life. And yet, when it comes to what’s important and predictive as it pertains to a presumptive franchise quarterback, your guess is probably as good as theirs. History shows us he can be slow. He can be weak. He can be dumb. He can be a bad teammate. He can even combine a few of those at once and still get drafted before the first bank of commercials. But as the NFL defined itself as America’s favorite pseudo-religion, and as the dumb and the weak and the slow cleared the underbrush for future generations of dumb and weak and slow, there remained just one thing a quarterback couldn’t be: short. Football’s merchants of speculation might argue about Wonderlic scores, hand sizes and the pitfalls of a country-club background, but they all view short the same way: quantifiable and damned obvious. Short can’t hide. 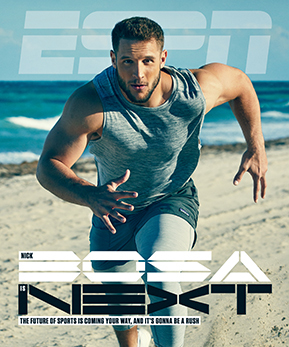 For more on the athletes and ideas that represent the future of sports, check out the May issue of ESPN The Magazine. • Will this tech experiment change football forever? • Can Kyler Murray upend decades of draft convention? Being tall excuses just about everything. If he’s 6-4 and dumb, they’ll call him football-smart. If he’s 6-4 and slow, they’ll tout his real or imagined ability to move in the pocket. If he’s 6-4 and weak, they’ll change his diet and point him toward the weight room. If he’s 6-4 and a bad teammate, they’ll surround him with veterans who can fix that right quick. Every flaw can be worked around or compensated for or beaten out, organizationally speaking. Except height. Oklahoma’s Kyler Murray measured 5-10 1/8 at the combine, and the number was reported as an achievement, maybe even a defining moment in the Heisman Trophy winner’s career. He is small, not just for a quarterback but for a high school point guard. And yet the Arizona Cardinals just might make him the first pick of the 2019 NFL draft. How did this happen? Did the NFL’s thinking change? Or is Kyler Murray that rarest of humans — the kind who can change the NFL’s thinking? MURRAY IS MANY things other than short. He is wickedly fast, smart, strong and slightly mysterious. He throws the ball with both ease and a force that can be measured audibly. He possesses an undercover agent’s awareness of his immediate surroundings and a distant reserve that is easily — and inaccurately, according to those who know — taken for cold detachment. It has been almost nine months since Nick Bosa played competitive football. Now, he shares the real story of how he left Ohio State after an injury last year — and how ready he is to start sacking again in the NFL. Sixty-four picks, two draft experts and several disagreements about the best prospect-team fits in 2019. Mel and Todd predict the first two rounds. The analytics that recommended Mayfield, another undersized Heisman Trophy-winning quarterback from Oklahoma, serve Murray well. Murray’s 11.6 yards per pass attempt was the highest by an FBS quarterback since 2004. And despite his height, he had just four balls batted down or defended within 5 yards of the line of scrimmage last season. Daniel Jones, a 6-5 likely first-round pick from Duke, had 14. In addition, the NFL’s lean toward more spread-style offenses (the kind Kliff Kingsbury will employ with the Cardinals) has lessened the perceived risk of a short quarterback. Evaluators can point to Russell Wilson and Drew Brees as evidence that shorter quarterbacks can find passing lanes inside and outside the pocket, and they can fulfill themselves by comparing Murray to Wilson-despite vast differences in speed and style-because nobody has much of an imagination anymore. It’s an interesting recommendation: Look, we know he’s short, but he’s always been short. Murray started for Riley at Oklahoma for just one year, and yet when Riley is asked if there’s one play that typifies Murray’s rare skills, he is silent for a full 13 seconds as he sorts them through his mind. Finally, he says it happened midway through last season, against Texas, when the Sooners’ offensive linemen so thoroughly botched a play that it’s a wonder they all made it out alive. The ball was snapped, and the right guard and right tackle pulled to the left while the left tackle pulled to the right. As they tried to dodge one another — there’s a split second where it seems plausible the right guard might ask the left tackle what he’s doing there — Murray acted as if this were the plan all along. He maneuvered past the pileup, sidestepped an unblocked defensive end, turned the corner and ran 67 yards for a touchdown. I. Jeff Fleener was an assistant coach at Allen High — home of the $60 million, 18,000-seat stadium — when he first heard that Kevin Murray had started a business to train high school and college quarterbacks in the area. That’s a good tip, right? Son of a former star quarterback is training in your area, be worth your time to check it out. “Oh yeah? How old is he?” Fleener asked. The guy shrugged and raised his eyebrows in a suit-yourself kind of way. “Yeah, but he’s 9,” Fleener said. II. When Oklahoma running back Trey Sermon was at Sprayberry High School in Marietta, Georgia, the last thing his quarterback did before he took the field on Friday night was take out his phone and watch a highlight video to get hyped for the game. The quarterback knew this Murray kid had never lost a high school game. Eventually, he would go on to win three straight state championships at Allen and enter the conversation about the best and most famous prep player in Texas history. III. Lincoln Riley is sitting in a deep leather couch in his office when he’s asked to recall his first impressions of Murray. The office has the feel of a sacristy — ornate furnishings, ceilings tall enough to create echo-y acoustics, a Vatican-level shrine of the sponsor’s brand of sneakers on one wall. It’s an oligarch’s office presided over by a 35-year-old guy in a sweatsuit and a baseball cap. The scene is worth mentioning because A) guys like Murray helped to build it, and B) it’s so comically outsized and ostentatious that even Riley seems a little embarrassed by it. Asked about Murray, Riley tugs at the bill of his OU golf cap and starts talking about the one and only occasion he’s known Murray to run a timed 40-yard dash, right after Murray transferred to Oklahoma in 2015. Is that why Murray didn’t run at the combine or his pro day? Riley draws his words out like blown glass. VIEWED FROM A certain angle, Kyler Murray’s life has taken shape as a variation on a theme. Thirty-six years before Kyler became an Athletic, 18-year-old Kevin Murray, Kyler’s dad, was drafted by the Milwaukee Brewers and played one unsatisfying year in the minors before deciding to play quarterback at Texas A&M. He was sued by the Brewers, who claimed breach of contract and demanded that Kevin’s $35,000 signing bonus be repaid. Kevin, who still runs a quarterback-training service, was a prominent figure at Kyler’s pro day workout in Norman. He was on the field helping his son warm up before his throwing drills, and he and his wife, Missy, stood directly behind Kyler as Zorn led the throwing session. “Kevin isn’t there so he can say, ‘Look what I’ve done,'” Zorn says. “He’s supporting his son. The son could say, ‘Dad, go away,’ and he would. But Kyler respects his dad and appreciates what he’s doing for him.” When I introduced myself to Kevin earlier in the day and told him I’d like to interview him in the coming weeks for this story, he nodded noncommittally and flashed a look that discouraged further conversation. Camp Murray is a tightly sealed ecosystem but is not without its complications: Kevin’s brother, former big league outfielder Calvin Murray, is a longtime lieutenant of agent Scott Boras, who handled Kyler’s baseball negotiations. When Kyler announced his decision to play football instead of baseball, any further public discussion of baseball was prohibited. Kyler and his parents declined to be interviewed for this story, and two sources — despite having nothing but laudatory things to say about Kyler — had to clear it with the family before consenting to speak. No man’s distrust is abstract, untethered to the lines and angles that shape his life, and in that light, Kevin’s protection of Kyler is understandable. Kyler is a 21-year-old public figure in a hypercritical environment where everyone has a voice, and opinions are wielded like knives. The insulation and learned circumspection is part of the reason Kyler lives in the spotlight and yet remains unconstrained by it. Athletes would seem to face a binary choice: Embrace the fame or avoid it. Either on guard or onstage. Murray resides in a third realm: He ignores its very existence. If you don’t acknowledge it, is it really there? And when it’s been there as long as you can remember — when coaches know your name when you’re 9 and kids four states over are watching your high school highlights as pregame hype — does it eventually blend into the background, just more white noise? And within those words is a mystery that remains unsolved: Is he blocking it all out, or taking it all in? Someone, probably someone in Arizona, is about to launch a revolt against the establishment, and who better to lead than a guy who leaves expectations flailing in his wake? Murray’s next challenge is both enormous and simple: upend decades of convention and, along the way, determine whether new expectations represent limits — or possibilities.